Universally appealing styling, with the packaging and refinement of a premium compact sedan. The new Insight, launching at Honda dealerships is the third new Honda electrified vehicle introduced this year. The Insight is unique in providing universally appealing styling, with the packaging and refinement of a premium compact sedan and fuel efficiency competitive with leading hybrid models. Powered by the third generation of Honda’s innovative and efficient two-motor hybrid system, Insight’s 151 net system horsepower combines with a lightweight structure to deliver the best power-to-weight ratio in its class. The Insight features three selectable driving modes – NORMAL, ECON, and SPORT – allowing drivers to customize their experience by maximizing efficiency or driving performance. Additionally, all Insights have steering wheel-mounted deceleration selectors to choose among three levels of regenerative braking performance, depending on driving conditions. In normal mode, the Insight is capable of all-electric driving for short distances. 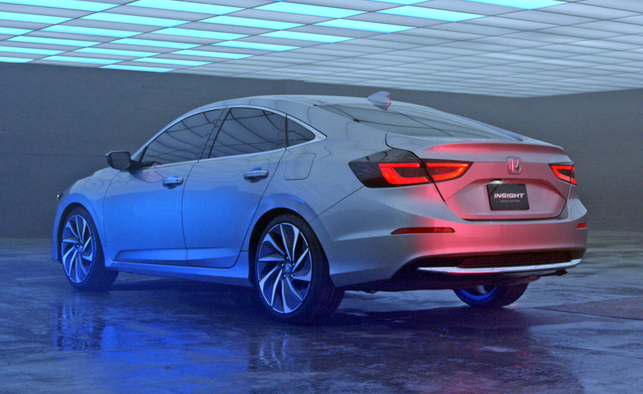 The 2019 Honda Insight will include the Honda Sensing® suite of advanced safety and driver-assistive technologies as standard equipment, which includes Forward Collison Warning (FCW), Collision Mitigation Braking System™ (CMBS™), Lane Departure Warning, Lane Keeping Assistance System, Road Departure Mitigation, Adaptive Cruise Control with Low-Speed Follow and Traffic Sign Recognition. The 2019 Honda Insight boasts a sleek sedan design with a low and wide stance highlighted by Honda’s signature “flying wing” grille and bold front fascia, low-profile LED headlights and taillights, sharp and dynamic character lines and sweeping coupe-like roofline. The Insight’s new chassis is designed to provide a highly refined, confident and composed driving experience. It utilizes a fully-independent suspension system – Macpherson strut front and multi-link rear – with liquid-sealing compliance bushings at both ends (Touring only). The Insight also features variable-ratio dual-pinion electric power steering. Confident and linear braking performance is provided by an electro-servo brake system, which seamlessly combines efficient regenerative braking and mechanical (friction) braking for ultimate stopping performance. Inside, the new Insight features premium cabin appointments including a soft-touch instrument panel with real stitching, ergonomically sculpted seats, a 7-inch color digital driver’s meter, standard heated front seats and available leather-trimmed seating and an 8-inch Display Audio touchscreen with Apple CarPlay™ and Android Auto™ integration. Article presented by Richmond Hill Honda. Efforts have been made to ensure the accuracy of the information presented above, though pricing, equipment, or other details may change at any time without notice. For more information refer to Honda Canada's website, or consult the vehicle's owner's manual.